In New York City alone, each elevator makes approximately 500 trips a day. Most individuals trust that elevators and escalators will not cause them harm. Unfortunately, this is not always true, especially when certified inspections are neglected. Injury and even fatality can occur when such crucial inspections are not done properly. If you or a loved one has been injured in a Queens elevator or escalator accident due to the negligence of another, an attorney at The Orlow Firm who is familiar with accident claim law can help you. You will work directly with a partner at our firm, which we believe you should expect from any attorney that you hire. Contact our Queens elevator accident attorneys today for assistance in recovering compensation for your pain and suffering. Call (646) 647-3398 or send us an online message. Surfaces are wet, causing a slip-and-fall accident. The metal teeth become loose and more prone to hooking onto clothing, fingers and toes. New York elevator and escalator accidents are commonly caused by improper installation and neglected inspections. Elevators and Escalators: Are They Safe? Elevators and New York City Housing: A Dangerous Combination? At The Orlow Firm, we use the phrase “elevator accident” with reluctance. The word “accident” implies that the incident was random, unpreventable and unpredictable. In fact, elevator malfunctions and subsequent injuries and wrongful death can usually be prevented by carefully following maintenance recommendations and standards. Unfortunately, while elevator maintenance companies and building owners know of risks, this knowledge is not always matched with increased diligence. If you have been injured or lost a loved one in a workplace elevator accident, the New York City elevator accident attorneys at The Orlow Firm can help you. We have handled third-party claims for hundreds of injury victims in Queens area, including numerous people injured in elevator accidents. Our law firm has more than 30 years of experience helping workers obtain the compensation they need after an elevator accident. Schedule a free consultation today. Call (646) 647-3398 or contact us online. Opened its doors on one floor when the elevator box was on another or had a misalignment problem? Our Queens elevator accident attorneys will draw on decades of legal experience while advocating for your rights. We have handled thousands of cases, and we understand that each case is different. We will provide you with the personal attention you deserve while we work to maximize your compensation. Our attorneys focus on obtaining compensation through claims against third parties for negligence. While workers’ compensation benefits themselves are usually limited to covering workers’ medical expenses and a portion of lost wages, they do not limit workers’ legal right to pursue compensation from other sources. Often, other parties like elevator manufacturers, maintenance companies and site contractors are responsible for elevator breakdowns. When third parties cause construction accidents, workers can file lawsuits against them in addition to filing for workers’ compensation. These third-party claims can result in more money damages than workers’ compensation. New York is home to many high-rise buildings and elevator systems. Each year, there are anywhere from a dozen to more than 100 elevator accident cases in the New York City area. Most aren’t very serious (a snagged purse or a harmless trip on an uneven surface are common), but others are extremely dire. If you have been injured in an elevator accident, the attorneys at The Orlow Firm can help determine whether negligent elevator maintenance contributed to the accident. Call (646) 647-3398 or contact us online for a free consultation. An elevator accident is not always an “accident.” In some cases, manufacturers, maintenance crews or inspection teams are to blame for improper maintenance or improper inspection of the elevator. In such situations, people can be at serious risk for injury or even death simply by taking the elevator. To uncover hidden negligence and maintenance errors, you need dependable injury attorneys on your side. 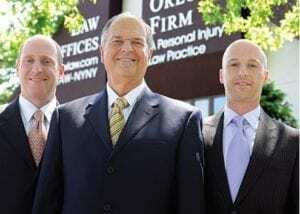 At The Orlow Firm, we are a team of father and sons attorneys who have made it our mission to defend those who have been injured in elevator accidents and other personal injury cases. Although the number of elevator accident cases is relatively low compared with other accident types, these cases quite often involve error on the part of a third party. If a third party is to blame for your accident, that party should compensate you for your suffering. We will pursue the manufacturer, the building supervisor or even the building inspectors if we find evidence to show that they are at fault. The fact that elevators are considered very safe (you have just a one in 12 million chance of being hurt on an elevator) is all the more reason to hold these third parties responsible for their maintenance mistakes. In New York, thousands of elevators are in use every day, facilitating millions of daily trips. While elevator usage results in relatively few accidents, the destruction caused by such accidents is often severe. From elevated heights, elevator accidents can be especially grave. Furthermore, elevator “accidents” are often not accidents at all. They may instead be the inevitable result of improper or defective construction of elevator shafts or improperly installed systems. Whatever the circumstances, our personal injury attorneys at The Orlow Firm can investigate if a defect or improper installation caused an elevator accident. We serve clients in Queens and throughout New York City. We believe you should expect the best from any law firm you hire. At our firm, you will deal directly with a partner. We have more than 30 years of experience and have handled many personal injury cases, including cases involving elevator accidents. To learn how we can help you, call (646) 647-3398 or contact us online. We are here to tell you that you don’t have to accept an offer, even if it initially sounds good. In fact, the more money you are offered, the more likely it is that you can recover an amount exponentially greater than the initial offer. Our injury attorneys will work to make sure that you can cover your medical expenses and the cost of providing for your family after a serious injury. If injured in an elevator or escalator accident due to the negligence of another, you should not be held responsible for the costs of your recovery and loss of wages. These costs may include hospital bills as well as physical and emotional recovery sessions. An experienced lawyer at The Orlow Firm will help you fight for your right to compensation for injuries and family fatalities. Contact us today for a free consultation. Call our Queens escalator accident lawyers at (646) 647-3398 or contact us online.